Do you want to engage your fans with a social media contest? This post will highlight ideas others have already used. Facebook was purposely excluded from this list as it falls into another category because of their strict guidelines. Although Instagram introduced video on June 20, 2013, Vine still has its place in the social media landscape for a few reasons. Vine videos loop and Instagram videos do not. Also, Vine videos will show directly in a users Twitter feed, where Instagram videos and photos will not. Twitter will not show a post from Instagram in a Twitter Card, which directly embeds the video. See Also: What are Twitter Cards? Now let’s get to the contest ideas. Vine also supports #hashtags, so you can create a hashtag for your brand and encourage participants to use that hashtag in their video submission. SociallyGold Tip: Don’t base winners solely on likes, comments and shares. Contests can easily be hacked, so have your winner chosen by a panel of judges instead. Several Brands have run Vine Contests, but the important takeaway is that the contests featured did not receive a ton of entries. You should only run a contest on a platform that you know your fans are on. Instagram does allow for video now, but creating a photo contest should attract participants. This platform also allows #hashtags, which you can use to encourage entries. Most of the Instagram contests I found also allow for entries on Twitter, but there is one I’d like to highlight. Pizza Express’ Get Kids Cooking Contest encourages entrants to download a certain recipe and post their photo to either Instagram, Facebook, Twitter and upload via the website. 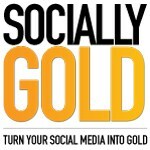 SociallyGold Tip: This contest has a high barrier for entry. You not only have to download the recipe, and take the photo, but you actually have to make the food. This could discourage the number of entries because of the number of steps. The digital pin board website is a great place to run a contest. Scotch Brand ran a contest to encourage their fans to add one (1) Photo of a project created using Scotch® Expressions Tape or Printed Scotch® Packaging Shipping Tape to a board on the entranst personal Pinterest page. The contest rules asked participants to email the link from their pin to a designated email address. The facilitator of the contest would judge all entries and add second round entries to a branded Scotch® pin board. SociallyGold Tip: Don’t base judging solely on repins and likes. Definitely include that as your criteria, but have judges also be in on choosing the winner. Pinterest will allow a user to repin an image to multiple boards, which could allow them to hijack the contest. These are just a few ideas of contests to run on platforms other then Facebook. Please keep in mind that you do not need to run a contest on every new platform. Make sure your fans are on that platform before jumping in the deep end to run a contest.